This pen provides a great platform for discovering, playing with, repairing, and designing electronics. Electric Paint can be used as a liquid wire to draw or print graphical circuits or even as a conductive adhesive that eliminates the need for soldering equipment. 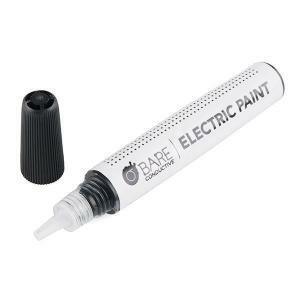 Electric Paint also comes in handy when repairing electronics such as PCBs or even old TV remotes. The paint can create capacitive surfaces to add interactivity onto almost any object. It is nontoxic, solvent free, and water soluble, which makes it great for use at home or in the classroom. Electric Paint can also work as a conductive adhesive on heat-sensitive surfaces like plastic.